Led by demand for commercial aircraft and automobiles, U.S. factory orders gained 2.1% in March, its first increase in seven months. Excluding the volatile transportation category, orders were flat from February. A slight uptick in business investments suggested stagnation amid weak global growth and the strong dollar. Non-manufacturing industries, which directly account for about 90% of the U.S. economy, expanded for the 63rd month in a row in April, according to the Institute for Supply Management. The pace of non-manufacturing grew to the highest level since November, which was the peak since at least 2008. Purchase managers report growing business activity from improved economic climate and stable conditions. 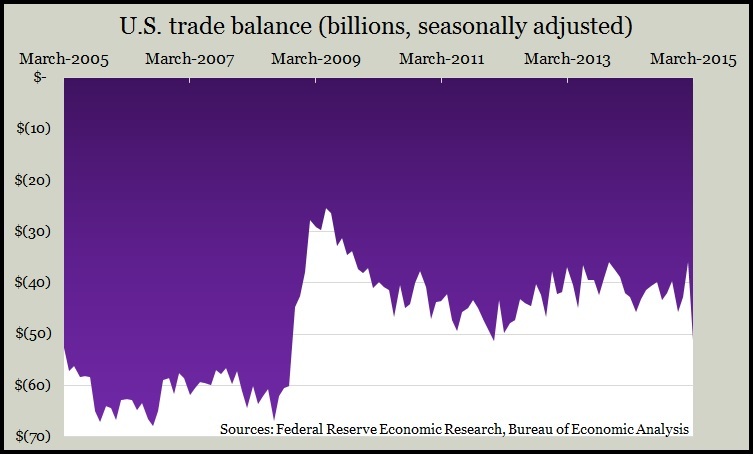 The U.S. trade deficit grew wider than expected in March, a whopping 43%, according to the Bureau of Economic Analysis. It was the most severe gap since October 2008 and reflected a surge in imports fueled by the strong dollars and the end of West Coast port strikes. Analysts say the greater gap might result in a first-quarter contraction in GDP. The annual pace of worker productivity fell in the first quarter for the first back-to-back declines since 2006. The Bureau of Labor Statistics reported a 0.2% drop in output and a 1.7% rise in hours worked. While harsh weather and the strong dollar cut into output, the training of new employees boosted hours worked. Year-to-year, productivity gained 0.6%, vs. a long-time average of 2.2%. The moving four-week average for initial unemployment claims dipped for the second week in a row and reached its lowest point since a 15-year low in November. Labor Department data showed jobless claims remain below the historical average, suggesting continued reluctance to let workers go. The Federal Reserve reported that consumer credit grew by $20.5 billion in March, which was more than analysts had expected. The debt expansion continues to be concentrated in non-revolving debt such as car financing and student loans. However, credit card debt, which is a sign of consumer confidence, rose for the first time in three months. U.S. employers added more jobs than expected but fewer than reported in March, further suggesting that an economic slowdown may be confined to the first quarter. The closely watched employment report from the Bureau of Labor Statistics showed payrolls still growing below the 12-month average, but some of the rising categories hinted at further expansion, including construction, computer systems design and technical consulting. Wage increases continued at a tepid pace. The same report put the unemployment rate at 5.4%, the lowest since May 2008. The Commerce Department said wholesale inventories grew 0.1% in March. While that was less than analysts expected, it came as sales declined for the eighth month in a row, suggesting companies have not been easing up on production and stockpiling enough to adjust to slowing demand. The ratio of inventories to sales stayed up at a level last seen during the recession.